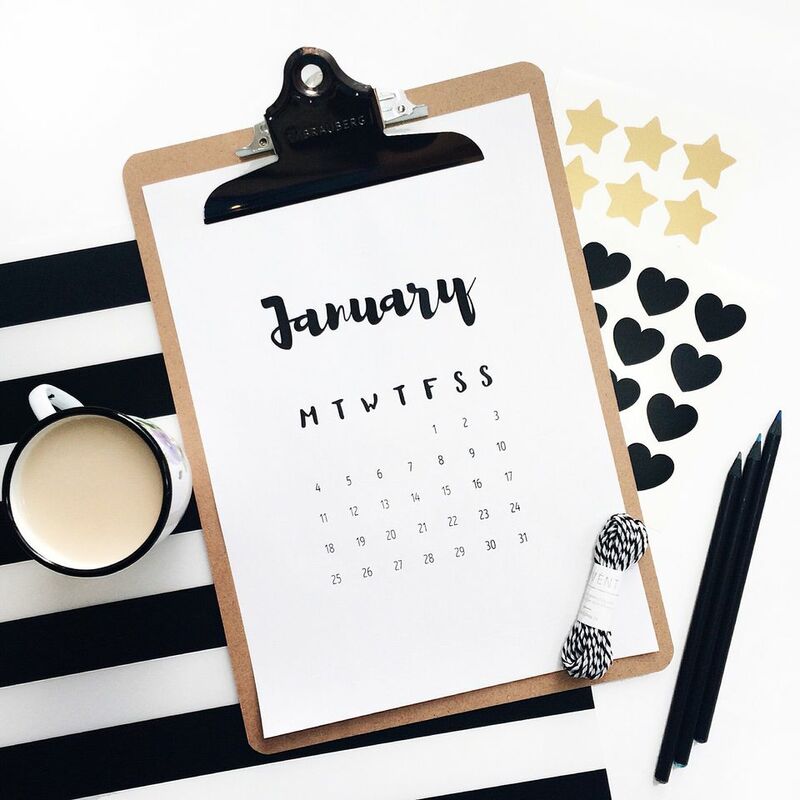 Make free printable calendars for yourself or to give as gifts using these templates and add your own creative touches to make each calendar page unique (Check out my decorating ideas and also ideas from visitors). For each month of each year featured, there are a variety of printable templates to choose from. Several designs feature the entire year on one page. Once you have your calendar pages printed, check out ideas for decorating them (page 2) and also ideas shared by visitors just like you (page 3)! There's also a collection of other free calendar resources and calendar of special events. If you want to be one of the first to know when new calendars and other craft projects are posted, take a few moments to sign up for the Family Crafts Newsletter. You can also chat about calendars and crafts with others in the Family Crafts Forum. Here are some suggestions for decorating the free, printable calendar template. You can also use these suggestions to decorate calendars you make yourself. Decorate the top half of a blank calendar page with pictures of friends and family members who have birthdays that month. Write the person's name on the appropriate date on the calendar. Make a collage using pictures cut out from magazines. Use pictures of items related to special days of the month or a certain theme. Draw a picture on the blank part of the calendar. Relate it to special events that month, birthdays, or a specific theme. Find clip art for each month. Use your own graphics program to add the clip art to the blank calendar. You can also print out the clip art, cut it out and glue it into place. Use stickers to decorate the calendar pages. Make a multicultural calendar. Choose 12 different ethnic or religious cultures and designate one for each month. Do some research about the ethnic or religious cultures--important dates, traditions, people, etc. Decorate the calendar with pictures and facts that pertain to each culture. If you have a fun calendar idea, you can submit it here. For help with printing your calendars, read this article about printing coloring book pages. Check out these great calendar making ideas submitted by other visitors. You can use them for decorating the free, printable calendar template and to decorate calendars you make yourself. From Patricia in Saskatchewan: Patricia shared directions for making a personalized calendar..
From Megan: "My family is spread all over the country. As Bailey is the first great-grandchild and grandson, everyone is always requesting pictures. In order to send many pictures and not clutter their lives, I began creating a photo calendar with pictures of my son and giving it as a Christmas gift to my very extended family. It is easy to mail, inexpensive to make and the family members get 13 pictures of him to enjoy all year long. The first year was simply baby pictures. The second year, the pictures were all themed by holidays, last year I made the theme sports. They have all been such big hits!" From Joyce Smith: Joyce shared directions for making an adorable photo calendar. From Beth Ann: "We're stressing responsibility as a theme this year in our Brownie troop, so our first activity will be for the girls to create their own Brownie calendar where they'll write in all the dates and times of our meetings and outings this year, along with whatever gear they might need for that event. We're hoping this will help them begin to understand that they can and should take care of some things for themselves. This is an idea that would be good for any group to do, not just Brownies." From Jan in CA: I have three ideas: The one I'm making for my 3 1/2-year-old daughter is a special occasions and events calendar, with each decorated page devoted to holidays, seasonal stuff and birthdays of friends and loved ones. For the birthdays, I am using the same format on each page: colored card stock appropriate to the month, topped with a birthday cake rubber stamp. I then use a mini balloon punch on each corresponding date on the calendar.The photos on each page correspond to that month's Birthday Bunch or to holidays we've shared together. My husband's calendar will include pictures of our daughter, one of her funny phrases per page and a piece of her artwork -- one of her preschool or home craft projects, reduced/color-copied at Kinko's and matted on coordinating card stock. Third is a "Family Recipe Calendar": There are plenty of food-related stickers and rubber stamps out there (Stampin' Up has a whole recipe-decorating set) to decorate each page. Add a cherished family recipe and a photo of the person behind it and...voila! From Heidi Kingery: This is a great CHEAP project for family for Christmas! All you have to do is buy (or make) an inexpensive a calendar. Gather together the dates of the birthdays and anniversaries in your family and fill them in on the calendar. I like to mark the birthdays with smiley face stickers and a bold colored border around the date. The anniversaries look good with heart stickers and an xoxoxo border around the date. I made these for my seven siblings for Christmas and they LOVED it!! They all have children and find it hard to find time to sit down and write the dates in a new calendar themselves. This way they have a gift that will be useful all year long! From Jo Dauzet: I run a latchkey program at our school. Every year I have the parents write down important dates that occur in their family (anniversaries, birthdays, dogs' birthdays, days off of school, vacations etc... I tell them to be creative) I then have the kids draw a picture for each month of the year. January--snow, February--Valentine's Day, March--Mom's birthday or St. Patrick's Day. I take care of the calendar by putting the important dates with each month. We then all decorate the actual calendar with stickers. We put the calendar together with ribbon and the kids then give it to their parents for Christmas. It is a gift that gives all year long and the parents love it. I have been doing this for four years and our parents love it. From Amber Jonson-Rogers: Get a two sided stand up plastic picture frame and set it aside. Take at least six sheets of white printing paper and cut 12 sheets of paper that fit the left side of your picture frame. Decorate your 12 sheets of paper for the 12 months of the year and make a calendar for each one. Put them in order from January to December and slide them in the left side of the picture frame and after every month take the top month and slide it in the very back of all of the other months. Now you have your very own reusable calendar! Put a picture of you, your family, friends, etc. it in the right side of your picture frame and you're done! From Linda: When my preschoolers were confused with the concept of time, I made a family calendar for them. The top part of the calendar was blank, except for a holiday-themed frame (eg, shamrocks and gold coins in February). The children would draw wonderful pictures in this spot. Then I wrote all of our family's and extended family's birthdays, anniversaries, holidays, planned vacations (anything that the children would find fairly interesting or important), on the appropriate squares. I took the photocopied pictures of the relatives, the holiday stickers, etc. and added them next. As doctor and dentist appointments came up, I would add these. Swimming lessons, soccer games and dance lessons soon became a regular weekly event to look forward to and gauge time by.